"People who live in the desert dream about water." That's what my friend said, anyway. 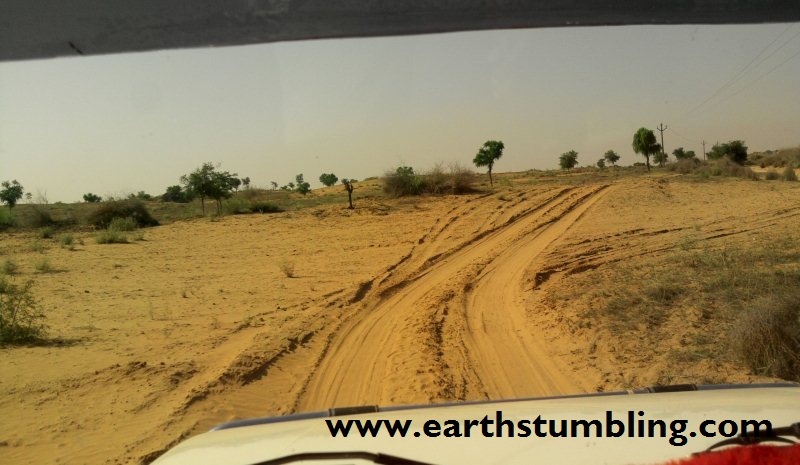 I just got back from a short stay in my friend's small desert village in northern Rajasthan, India. It is a village covered in sand, far from any town--a village so remote that it took three phone calls and three hours to get me a paracetamol (aspirin) for a fever I was having. One night my friend and I got to talking about dreams. We realized that we had many dreams in common: being able to fly, being chased but you cannot run, being caught without any clothes on in a public place, trying to shout but not being able to. However, there was one reoccurring dream that he had that I could not relate with: being thirsty but not being able to find water. I have never had a dream like that. He told me that he and his brothers have had this dream many times. In fact, this is one fear in the desert. They hear news of children dying in their sleep, literally dying of thirst. They believe that the warm winds of the peak hot season sap water straight from their babies in the middle of the night. This is why if they hear even the slightest whimper from their children, mothers wake them up to drink some water. I was interested in learning how they survive in the desert, so I started by asking about their history, and I was surprised that it started out with violence. Only a few generations ago, their grandfathers fought for this land. I thought, "This place had no water, no trees, no nothing. Someone actually fought for this portion of desert?" I asked, "Why?" The reply was that they wanted a place of their own. Slowly, I put pieces of their history together. I was mainly interested in the development of water. They told me how they had to travel for hours and hours to carry water by camel. Then finally their grandfathers manually dug the well near their home. This seemed sufficient until Germans came and told them that the water has excessive amounts of fluoride, which could lead to fluorosis. A plan was already in place to fit these remote desert villages with toilet and bathing facilities and to pipe in treated drinking water. One old aunt laughed as she said, "I remember when they put in the tap. We were dancing and had flowers!" The toilets seem to be doing okay, but the tap has been long dry. They say that it was getting too expensive to maintain. And that's when the canal reached their village. Basically, it changed their lives. Looking at the canal from the water "lift"
The Indira Gandhi Canal Project in Rajasthan started in 1958--a project started to water the desert. 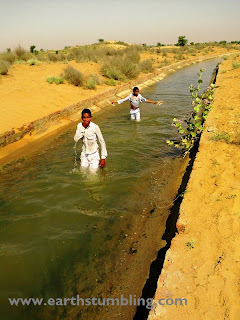 Said to be one of the largest canals of India, it took about 35 years for the canal waters to finally reach my friend's village. One of the biggest changes that took place is that they can now have another growing season. In the first season, they use the canal water to grow crops like wheat and chana (chickpeas). Their second growing season, during the monsoon, is now fully taken over by one crop--guar. Guar does not actually take that much water to maintain. Even when there was a freak rain a couple days before I arrived, guar started to grow wildly in the my friend's family field. Not a day would go by without my friend's father asking me about the market conditions for guar in the US. All I could do was throw up my hands. The second major impact of the canal water is that they now have a fresh supply of drinking water without excessive fluoride content. However, this is regularly driven in and stored in underground concrete tanks. The nearby well water is now only used for the animals and for other domestic uses. I had many more questions as I explored the village and the surrounding area. How much should the government invest in irrigating the desert? How much more should the village develop? When I was there there was a poorly managed health clinic and a very small shop. As young people become more and more educated and less inclined to farming, what is the future of such a village in the desert? How has watering the desert affected the hydrological dynamics and ecology of downstream communities? How "green" should we try to make a desert? The benefit of greening a desert is that it reclaims land for productive use, pushing against forces of desertification. I explained to my friend that in the US, we have also greened our deserts. In California, canal water from far off states irrigate fields of oranges, rice and almonds. We've been able to build cities with water parks in the desert. But has this been so wise? People have started to plant trees in my friend's village. I told him, "Once you start planting trees, it's usually easier to plant more trees later. Trees then change the micro-climate of the area." My friend started to think about it, saying that he had not thought of that aspect of the forest--how it affects the hydrologic cycle, how it can bring water to an area. As things slowly change in my friend's desert village, it is quite possible that they may stop having dreams of thirst and water. And it's quite possible that they will start dreaming of new things all together. Nice article. It made me think of Las Vegas at one point.